Yellow Pine is at the bottom of the Janka scale. Yellow Pine flooring is typically graded Clear and #2 Common and Better. The red heartwood of the tree is sold as “Heart Pine.” Heart Pine is sold in Clear and #2 Common grades also, although some manufacturers produce other grades. Clear Yellow Pine flooring is the highest grade of Yellow Pine. It has a very uniform yellow color without knots and defects. 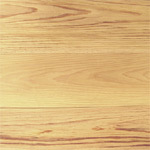 #2 Common and Better Yellow Pine flooring includes all the character found in the wood. Large knots, light yellow sapwood, and some dark heartwood are found in this grade. Lumber made from the actual heartwood of the tree is called Heart Pine, which has a reddish color. Although it is more desirable than Yellow Pine because of its color and hardness, genuine Heart Pine is harder to obtain. When the first settlers arrived in the Americas in the 1600s, old-growth trees were plentiful, and they were able to grow large enough to develop ample heartwood. By 1900, most of those first-generation trees were gone in the eastern United States, since this wood was the primary building material for the homes and factories of the burgeoning country. Most structures built after 1900 used wood from second-generation trees that did not have time to develop heartwood and thus do not exhibit the very tight rings associated with the first-generation timber. Nowadays, “Heart Pine” is generally considered to be recycled timber from structures originally built with first-generation trees.